Bomb: The Race to Build--and Steal--the World's Most Dangerous Weapon by Steve Sheinkin received awards from several committees. It won the YALSA Award for Excellence in Nonfiction for Young Adults, the Robert F. Sibert Informational Book Medal, and a Newbery Honor. I didn't review this book, but I have been talking about it to anyone who will listen -- one of my favorite books of the year. I've been cheering it on for months. Extra Yarn illustrated by Jon Klassen received a Caldecott Honor. This is another of my favorite books from 2012. Mr. Klassen's other excellent book from this year, This Is Not My Hat won the Caldecott Medal. I'll bet he's celebrating big. Pamela Zagarenski received a Caldecott Honor for Sleep Like a Tiger. I can hardly wait to see what she does next. The One and Only Ivan by Katherine Applegate won the Newbery Medal. Even though Ivan didn't make my personal favorites list this year, I did vote for it in the Mock Newbery because I think it is distinguished writing for children. I love Ivan's voice and the characters are well-drawn -- really, a beautiful book. The Caldecott committee recognized five honor books this year. Yep, FIVE! Count 'em: Creepy Carrots! illustrated by Peter Brown, written by Aaron Reynolds; Extra Yarn illustrated by Jon Klassen, written by Mac Barnett; Green illustrated and written by Laura Vaccaro Seeger; One Cool Friend illustrated by David Small, written by Toni Buzzeo; and Sleep Like a Tiger illustrated by Pamela Zagarenski, written by Mary Logue. The Newbery Honors went to Splendors and Glooms by Laura Amy Schlitz, Bomb: The Race to Build--and Steal--the World's Most Dangerous Weapon by Steve Sheinkin, and Three Times Lucky by Sheila Turnage. The disappointing news, at least in my opinion, is that Kevin Henkes wasn't recognized for his excellent Penny books. I would have loved to see either Penny and Her Song or Penny and Her Doll (or both) recognized by the Geisel Award committee this year. Ah well, there is always next year. And finally, the Laura Ingalls Wilder Award which "honors an author or illustrator whose books, published in the United States, have made, over a period of years, a substantial and lasting contribution to literature for children" was given to Katherine Paterson. Her books include The Great Gilly Hopkins, Bridge to Terabithia, Jacob Have I Loved, The Master Puppeteer, The Day of the Pelican, and many others -- definitely "a substantial and lasting contribution." Even though I enjoyed Lily's Crossing, Pictures of Hollis Woods, and Eleven by Patricia Reilly Giff, I was a little reluctant to pick this book up because from the brief description I read, it didn't sound like the kind of book I would like. 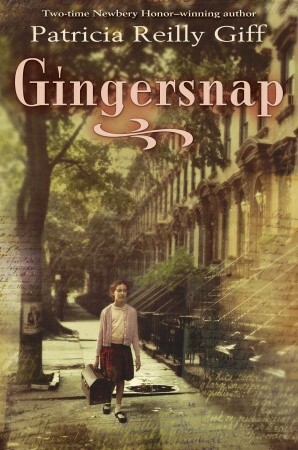 Happily, as it turns out, Gingersnap is exactly the kind of book I like. Jayna is a young girl growing up without parents during World War II. So, when her only living sibling is sent to war, she is left with her prickly landlady. She meets a remarkable ghost who stays with her and helps her get through the tough times. Jayna decides to leave--giving Celine, the land lady, "her life back" and go to Brooklyn to try to find her family. There she finds some unexpected friends and pieces of her past. Don't let the ghost in the book stop you from reading it. I don't care for ghost stories, and while there is a ghost in the story, I think it is safe to say that this is definitely not a ghost story. But the the ghost does help Jayna makes some scary choices, and she helps make the tidy ending believable. I loved how believable the characters were. From an obstinate child, a sharp landlady, a confused ghost, and a considerate brother, Giff captures them all. And the relationships, even with the characters who don't show up until toward the end of the book, are loving, encouraging, and real. "Throw it all in and let it simmer. You don't have to pay much attention. Stop cooking when you get sick of waiting." "Breathe it in as you sip. Think of the steam, the saltiness, the warmth." Jayna is a really funny girl, and I was constantly laughing at her side commentary. Overall, I loved this book, and would recommend it to all readers--especially middle grade readers. We all have guilty pleasures, right? Mine include watching old black and white movies late at night and reading children’s books (even if my children aren’t around) - some things just inherently make me happy. Jan Thomas writes picture books that easily speak to children with her bright pictures and comedic story lines. I would classify them as a child’s guilty pleasure. Perhaps they are not the most sophisticated tale, or even the most detailed artwork - but, somehow when it comes together, it always elicits a cheerful giggle. 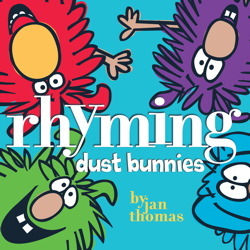 I have to thank Betsy Bird (A Fuse 8 Production) for introducing me to Jan Thomas with her reading of Rhyming Dust Bunnies. You can check it out here: Rhyming Dust Bunnies. This is a book I may never have picked off the shelf, but is a sure favorite with any young child. Who could resist cute, fluffy dust bunnies that play rhyming games? Since then, we have expanded our Jan Thomas library by adding The Doghouse and Let’s Sing A Lullaby with the Brave Cowboy (released September 2012). Both have been instant hits. These books all have a similar feel to them, yet work on their own merits. 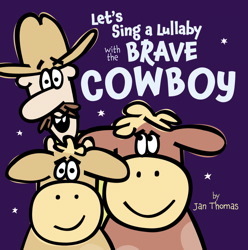 Let’s Sing A Lullaby with the Brave Cowboy is a story about a slightly fearful cowboy and his attempts to sing his cows to sleep. Of course, things don’t go smoothly, as he is afraid of objects that are not at all scary, like a flower and a stick. The pages are perfectly ordered to build the suspense and keep you involved and as an added bonus, the story is enhanced by listening to the cowboy sing his lullaby at www.janthomasbooks.com. The bright, solid colors outlined with a thick black line illustrate the story in a way that instantly screams “preschool.” The characters are big and graphic, and perfect for story time. On Thursday last week, I returned home from story time at the elementary school where I had read, to the general delight of twenty or so children, Monkey: A Trickster Tale from India, retold and illustrated by Gerald McDermott, and found this sad announcement from PW Children's Bookshelf of McDermott's passing. I always looked forward to his new books--one of the great talents whose books I love. You can also read an obituary from School Library Journal on their website. In happier news, the finalists for the 2012 Cybils Awards have been announced. Check out the finalists on their website. And soon we'll see the contenders for School Library Journal's Battle of the Kids' Books. Lots of good commentary, and it's fun to play along. Speaking of awards, we are about two weeks away from the 2013 ALA Youth Media Awards announcements which, of course, include the announcement of the Newbery and Caldecott Award winners. You can watch the announcements in person on January 28 at the American Library Association Midwinter Meeting in Seattle or stream them live via the internet here. If you want to know how winning one of those gold, shiny medals changes an author's or illustrator's life, you can read the Publishers Weekly article, "The Call That Changes Everything -- or Not," on their website. 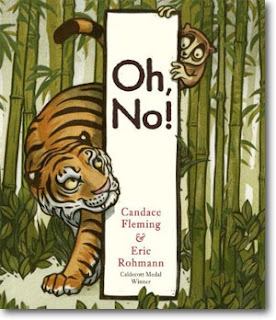 My first-grader loves scary books (well, maybe not actual scary books, but the idea of scary books) so books about ferocious animals--real or imagined--usually make it onto our must-read list. In 2012 we read about snakes, taco-loving dragons, creepy carrots, a fish-eating fish, and tigers. In fact, three books about tigers are new favorites at our house; each has a different tone and a distinctive personality--all are terrific. First up is It's a Tiger! written by David LaRochelle and illustrated by Jeremy Tankard. The story starts in the jungle where "the monkeys swing from vine to vine" except one of the tails doesn't belong to a monkey, it belongs to a tiger. "Run!" warns the narrator. And he runs from the tiger into a bat-filled cave where a suspicious shadow turns out to be . . . yep, the tiger. 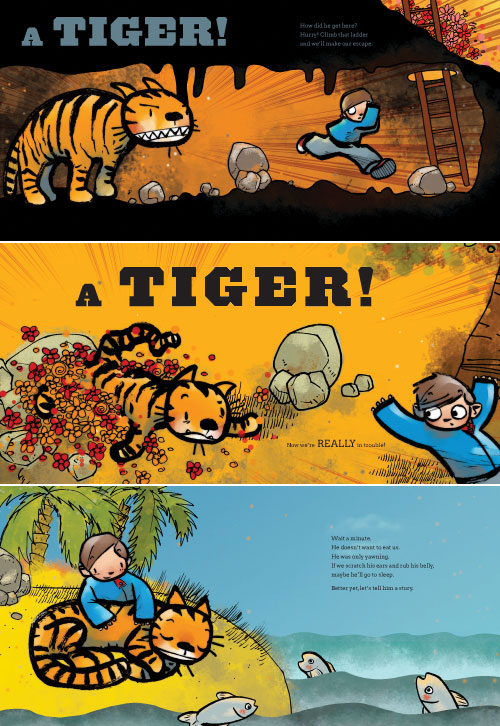 The tiger seems to always be one step ahead of the narrator (and the reader) -- across a pit of snakes, into a bed of flowers, onto a boat, and finally to an island where we discover the tiger may not be so scary after all. But . . . what about a crocodile? Tankard uses brilliant oranges, reds, yellows, greens, and blue in his cartoon illustrations. The not-quite-scary, but not-quite-cute tiger is equally believable in both his roles. A combination of thin and thick linework creates layers that allow the central elements--outlined in bold, black lines--to seemingly float above the page and ensures the focus stays on the boy and the tiger. Anticipation, brilliant pacing, and the magic of page turns makes this a great story to share, especially with younger children. 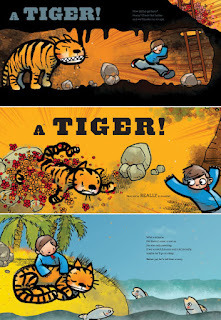 You can read more about making the art for It's a Tiger at Chronicle Books Blog. I'm always excited to see anything new by Candace Fleming, and when I heard she had a new picture book coming out that was illustrated by Eric Rohmann, I practically did cartwheels. And Oh, No!, which came out in September, is definitely cartwheel worthy. The story begins on the endpapers when Tiger spots Frog and continues on the title page with Tiger chasing Frog off the right-hand side. When Frog falls into a "deep, deep hole" other animals come to his aid, but unfortunately, they end up trapped in the hole with Frog. All the while, earth-toned illustrations showing a tail and claws remind us that Tiger lurks nearby. My favorite spread is when Tiger, licking his teeth, comes to "help" his victims. Tiger is wickedly fierce, and the trapped animals huddle together, all appropriately frightened, but what I really like is how Rohmann manages to give each animal a unique temperament. In the end, Tiger gets what he deserves, and the animals walk away with a final, "Oh, no!" Mouse came along, but what could she do? Mouse came to help, but what could she do? Mouse was so small, what could she do? and she fell in, too. Finally, Sleep Like a Tiger, a book that came out at the end of October, is a gorgeous book that, because it came out late in the year, may have slipped under the radar, but really deserves some attention. In lyrical prose, Mary Logue tells the story of a little girl who doesn't want to go to sleep. The girl's clever parents nod their heads and agree that their daughter doesn't have to go to sleep, but she must "put her pajamas on." Once she has climbed into bed, the girl asks, "Does everything in the world go to sleep?" and her parents assure her that the dog and cat are asleep, and bats, whales, snails, and even bears--the "mighty sleepers"-- sleep. Reassured, the girl wriggles under the covers "like the cat in front of the fire," snuggles "deep as a bear", and finally, "like the strong tiger," falls fast asleep. Pamela Zagarenski's illustrations contain an abundance of suns, wheels, stripes, crowns, and tigers. The subdued palette and the stylized art imbue the book with a dreamlike quality, fitting for a crowned little girl and her similarly adorned parents. (As an aside, I really want to be that mother. I need a crown.) Each page echoes the previous pages while moving the story forward. With plenty of detail to hold your attention, even on repeated reading, the pictures create a world where whales, a toy llama, and a rag doll are perfectly at home. 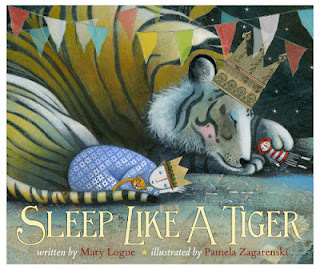 Zagarenski even manages a nod to The Little Prince and William Blake's "The Tiger." The copyright page says, "The illustrations are mixed media paintings on wood, and computer illustrations." I say, "Wow!" Starting today you can register to attend the 26th BYU Symposium on Books for Young Readers in Provo, Utah. Always outstanding, the symposium brings librarians, teachers, and other people who love children's literature together with authors and illustrators. This summer they have an amazing lineup of presenters, including Karen Cushman, Philip and Eric Stead, Steve Jenkins, Tony DiTerlizzi, Sara Pennypacker, and Jennifer Nielsen. If you are going to be in or around Utah in July, you should plan on attending. You can find more information at BYU's website.